Lois Lerner, the head of the tax-exempt organizations division of the IRS, has been placed on administrative leave, an administration official has confirmed to CBS News. Lerner has come under fire for failing to alert Congress of the undue scrutiny that some IRS officials in her division had placed on conservative groups applying for tax-exempt status. Thursday afternoon, Sens. Carl Levin, D-Mich., and John McCain, R-Ariz., the chairman and ranking member of the Senate Government Affairs investigations subcommittee, called on Daniel Werfel, the new acting IRS commissioner, "to suspend immediately Lois Lerner from her office as Director of the Office of Exempt Organizations." IRS' Lerner: "I have not done anything wrong"
WH says criticism of its handling of IRS story is "legitimate"
In a letter to Werfel, Levin and McCain accused Lerner of not being forthcoming about the targeting scandal during an hours-long interview by the subcommittee, writing that she "failed to disclose the internal controversy over the search terms used by the Cincinnati office to identify 501(c)(4) groups for further review, the actions taken by that office in reviewing the identified groups, the investigation and imminent findings by the Treasury Department Inspector General for Tax Administration (TIGTA); and TIGTA's conclusion that the IRS had used inappropriate criteria to target Tea Party and other conservative groups. Ms. Lerner also failed to disclose that she was fully aware of these issues as early as June 2011, and, according to TIGTA, had been personally involved in reviewing questionable actions taken by the Cincinnati office." "Given the serious failure by Ms. Lerner to disclose to this Subcommittee key information on topics that the Subcommittee was investigating, we have lost confidence in her ability to fulfill her duties," they continued. Lerner has also taken some heat for refusing on Wednesday to answer questions before the House Oversight and Government Reform Committee. Committee chairman Rep. Darrell Issa, R-Calif., told CBS News on Thursday that she waived her Fifth Amendment right to remain silent by making an opening statement,. Issa told CBS News he feels "obligated" to bring her back to the committee and may do so after the House's Memorial Day recess. 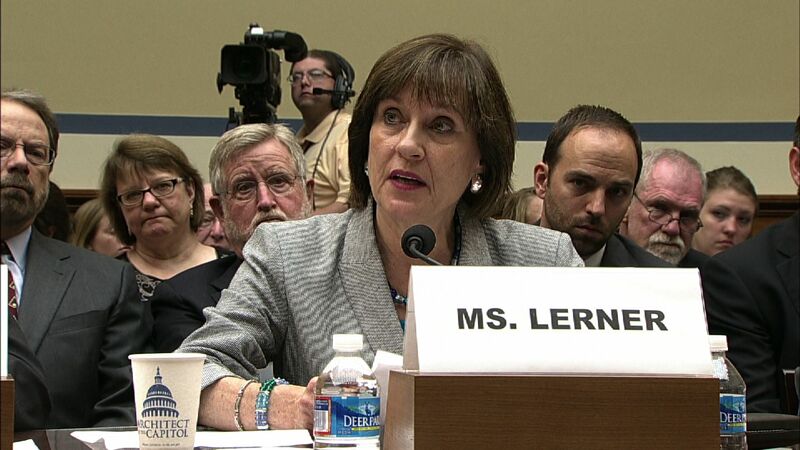 Lerner invoked the Fifth Amendment on Wednesday, at the start of a hearing on the misconduct at the IRS. However, before she did so, Lerner proclaimed her innocence. "I have not broken any laws," she said. "I have not violated any IRS rules or regulations, and I have not provided false information to this or any other congressional committee." The whole committee, Issa said -- including Democrats -- was taken aback by her decision to make an opening statement. Indeed, her decision did prompt some outcry at the hearing, with Rep. Trey Gowdy, R-S.C., declaring, "That's not the way it works." By making factual statements about the misconduct at the IRS, Lerner may have technically given the committee the right to ask her further questions, according to some legal analysis. Issa's office has said that after consulting with legal counsel, they have concluded Lerner's Fifth Amendment assertion is no longer valid. She remains under subpoena, and the committee is looking at recalling her for testimony. Lawmakers from both sides of the aisle have wanted to hear from Lerner as they try to get to the bottom of the IRS scandal. House Minority Leader Nancy Pelosi, D-Calif., said to reporters Thursday, "I do think the American people deserve answers. I wish she would have provided them. I don't know what her basis is for taking the Fifth, [but] it's her legal right to do." "We all are concerned about how the IRS does what it's supposed to do, supports the law, but does not do it in a selective way," she said. Responding to questions of whether President Obama should be responsible for the misconduct in the agency, Pelosi said, "the president doesn't know about everything that is going on in every agency of government." To underscore her point, she noted that the site of the misconduct -- an IRS office in Cincinnati -- is from House Speaker John Boehner's home state. "I don't think you can hold him accountable for that IRS office," she said. The White House has acknowledged there have been "legitimate" criticisms about the way the administration has disclosed what it knew about the scandal. Boehner on Thursday continued to hammer the White House on that point, remarking, "Today is a new day, which means that we're sure to get a new story from the White House on the IRS scandal... Every day, there's something new. We don't know how deep this extends within the administration, and that's why our committees are going to continue to investigate this."